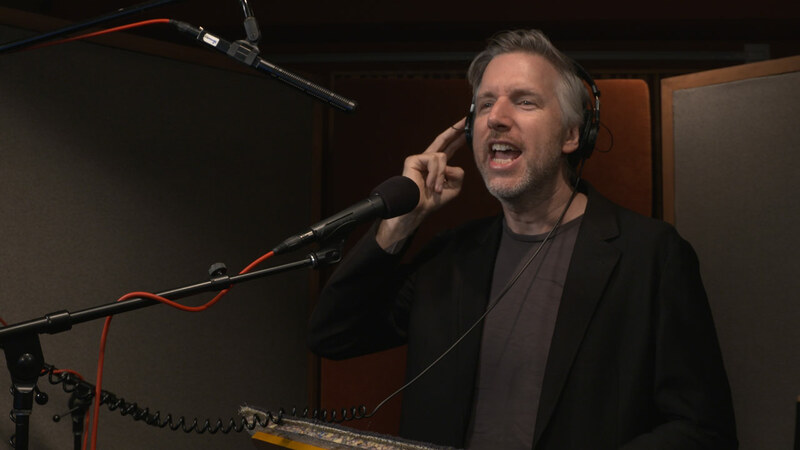 The voice of General Grievous has become iconic thanks to the work of the original actor behind the mic, Matthew Wood. To mark the arrival of Grievous this week in Star Wars Battlefront II, StarWars.com caught up with Wood, also supervising sound editor at Skywalker Sound, to discuss his return to the character, the Jedi hunter’s past, and his life beyond the screen. StarWars.com: Why do you think the decision was made to bring General Grievous to Star Wars Battlefront II? Matthew Wood: Well, he’s been kind of a fan-favorite for a long time. In Grievous, you’ve got somebody who’s got the unique ability to wield multiple lightsabers, and he’s been trained by Count Dooku. The four lightsabers make for a very interesting looking character. His fury for the Jedi and wanting to secure his place as a Separatist leader drives him to be evil. He’s got a lot of animosity, anger, and a pretty cool skill set. Since his introduction over a decade ago, people have been interested in learning more about him and his story. This allows them to walk in his footsteps a bit. 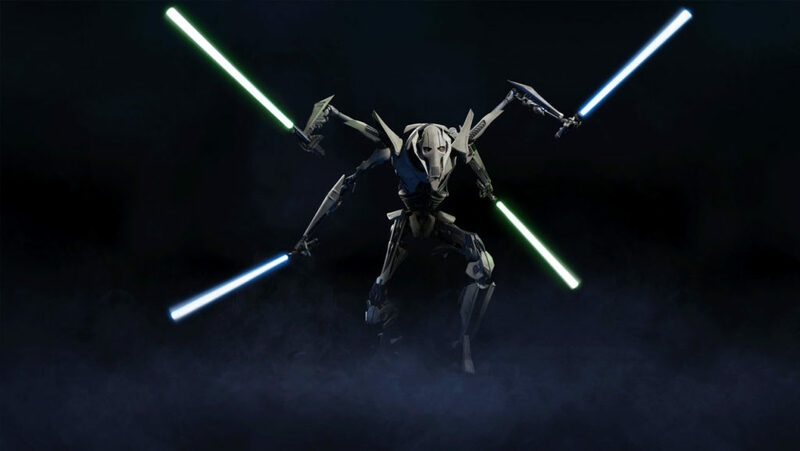 The General Grievous character model for Star Wars Battlefront II. StarWars.com: What do you think makes Grievous one of the more intimidating figures in Star Wars? Matthew Wood: Well, Grievous has kind of an ambiguous past, but you know at some point he’s been wronged pretty badly. He’s been manipulated by dark-side figures like Count Dooku to take his anger and weaponize it towards the Jedi. He’s also, of course, in charge of this gigantic droid army, which he also equally gets frustrated with. Particularly when they go up against the Jedi. [Laughs] But you also know deep down he’s got pain in his past, and he’s certainly armed to the teeth to manifest that pain physically upon his enemies. StarWars.com: You mentioned Grievous’s ambiguous past. One of the lines you have in the game is, “The Kaleesh are not known for their mercy.” Given how much we know about Grievous and his history, how do you interpret this line? Matthew Wood: I’ve always worked under the assumption that he was a pretty amazing warlord in his past while he was more biologically complete. I think that’s why someone like Count Dooku would have taken him and tried to weaponize him, because he’s got the skill set to be this mad general. In some of the books and certain storylines of The Clone Wars we touch on his past. Anything I can do to imbue more depth into this character through the writing in this game is incredibly exciting. It’s really my goal to make him all the more menacing and I can’t wait to watch people play it. StarWars.com: You also have a line exclaiming, “The story of Obi-Wan ends here!” What do you think about the Obi-Wan/Grievous relationship? Matthew Wood: Even back when it was Ewan McGregor and then James Arnold Taylor doing scenes, it always sort of felt like a Joker and Batman situation with Obi-Wan and Grievous’s banter. There are real things at stake, but they are both just so highly skilled in their craft that they’re almost evenly matched. Of course, Obi-Wan eventually gets the upper hand in that. To be able to revisit that dynamic in Battlefront II is always fun. Those two are like star-crossed in a certain way. It’s really fun for me to participate in that as an actor. StarWars.com: You’ve encountered Obi-Wan across a variety of mediums and voiced Grievous in even more beyond that. Do you approach playing Grievous in a video game differently than you would in another format? Matthew Wood: I would say I try to make him have parity across the entire pantheon of Star Wars projects. I want him to have a consistency. Sometimes it changes up a bit. One instance of which is, there’s a banter between Obi-Wan and Grievous in Revenge of the Sith when Obi-Wan jumps out of the rafters on Utapau and he says, “Hello there!” We actually changed that so Grievous said it first in Clone Wars when he jumped down and said it to Obi-Wan. Again, the banter between them! I love that stuff. StarWars.com: You love the banter, and people online love Grievous. Presently, he’s rooted himself in several memes and a wide swath of online discussion. How do you feel about this unique way of looking back on the character? Matthew Wood: I must say, I love that stuff. I go to some fan events and meet Star Wars fans from all over the world, and they’ll come up to me and say, “Hello there!” [Laughs] And of course, I have to say, “General Kenobi!” Just to see that and how it plays out in the memes, it’s hilarious. There was a really great one with the Christopher Robin trailer where Ewan McGregor says hello to Winnie the Pooh and suddenly Pooh whips out his lightsabers and goes, “General Kenobi!” [Laughs] There’s all these different ones that I just think are hilarious. It really just shows the love of the prequels and that generation of the prequels has now grown up and turned their attention to the greater meme culture! Some of those people must be in their 20s now. StarWars.com: I’m one of those younger-20s, Grievous-loving people, Matt! Matthew Wood: See! Exactly, Star Wars is such a special thing where it does transcend multiple languages and continue to speak the story. To have anything that’s lasted this long is a humbling experience. StarWars.com: Bringing it back to some of your voice acting, you mentioned having parity across your performances. Grievous has several lines that are quite imposing, but some that are also relatively jovial. How do you keep a more light-hearted line equally menacing? Matthew Wood: To perform Grievous, I have to project almost everything I say in a specific way. I also provide the unique voice processing given that I’m a sound editor at Skywalker Sound. I use my own tools to make that happen. There’re certain frequencies that I need to hit to sound like Grievous, but for sure, some of those lines are said with a cyborg-smile. I think that even comes through with the processing. I think the funniest thing I had to do once was a commercial for Cartoon Network during Clone Wars where Grievous was sitting home alone on his computer. He was looking at dating programs and then looking at his DVR to see what he recorded, while simultaneously singing some 80s song at the same time. So that’s like the most I’ve ever done comically. [Laughs] That being said, I do like taking a character who is supposed to be playing it straight and then twisting him like that. StarWars.com: Do you think Grievous has a respect for the Force in anyway, or is it a resentment? Matthew Wood: Not to get too psychological about it, but he really does want to make a point. When he’s fighting Obi-Wan in [Revenge of the Sith] he says, “You fool! I’ve been trained in your Jedi arts by Count Dooku.” I think in that moment, Grievous was trying to size himself up with the Jedi by implying that he can take them even without the Force. It’s bluster, you know? I think he knows the fact that the Force is always against him and a tool of the Jedi to use is constant in his mind. So I think there’s an overall respect — he’s a general and he respects a warrior. He’s also pulling the Jedi far away from their mission to be keepers of the peace, and helping to drag them into this gigantic war. To let someone like Darth Sidious come to power during this time of war is only because the Jedi have become so distracted by this battle when they should be keepers of the peace. Grievous is all part of this master plan by Sidious to distract the Jedi, and he’s been employed for that purpose. Even though Grievous probably thinks he’s just there for revenge of some sort. StarWars.com: What advice would you give to players who encounter General Grievous in Star Wars Battlefront II? Matthew Wood: Oh, man! I guess I would say fortify yourself, don’t get distracted by my quips. [Laughs] Even though it may sound like I’m dropping one-liners, Grievous is an evil character who needs to be respected, and I hope you have hours and hours of playing time under your belt before you try to face off with him. You’re going to need to be ready! Check out StarWars.com’s interview with EA DICE on creating General Grievous for Star Wars Battlefront II! Read StarWars.com’s interview with more stars of Star Wars: The Clone Wars returning for Star Wars Battlefront II! Tyler Westhause is a contributor to StarWars.com and previously worked for PlayStation. He is also known as an active member in the gaming and podcasting communities. More than anything, Tyler is happy to run your ear off about why Star Wars: Knights of the Old Republic is the greatest video game of all time. Follow him on Twitter @twesthause.